Our initial application for funds from the Heritage Lottery Fund (HLF) in Autumn 2017 was not successful. Having learnt from the experience we are now amending the application and modifying the plans for the building in order to address feedback from HLF. The main issue which caused concern for HLF was the building of a new extension. As a result the Village Hall Committee is redrawing the plans and intends to resubmit an application based on renovating and improving the existing Hall with a new internal layout but without an extension. We have planning permission for the extension, but we have decided to concentrate our efforts on the existing building at the present time leaving scope for a phase 2 development (i.e. the extension) in the future. For more detail see the Future page. We have taken advantage of the Autumn half-term break (2018) to re-decorate both the Main Hall and the Small Hall. In addition, we have added a wainscot to the Small Hall which gives it a much smarter appearance. Issues with the flat roof on the toilet block have finally been resolved - an area of roof has been re-boarded with new roofing materials on top and a new ceiling internally. Medbourne Village Hall is looking for a Secretary who is able to attend monthly meetings and undertake some small administrative duties. This includes taking, writing up and circulating Minutes from the monthly meeting (10 per year); preparing and circulating monthly Agendas; ad hoc administrative support. Please contact medbournevillagehall@gmail.com or one of the committee members for further details. Welcome to Medbourne Village Hall located in the heart of the beautiful Welland Valley. The Village Hall, built as the school in 1868, is an important asset for all the community. As well as the Pre-School 3 days a week, there is a weekly Surgery and other regular meetings including the Parish Council and the WI. The 1st Welland Valley Scouts meet on Thursday evenings and there is Pilates on Friday mornings. 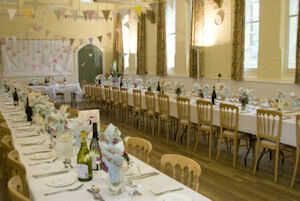 The hall is also available for private hire. If you have an idea for a new group or want to be involved, we would love to hear from you. This website will help you to find out more about hiring the hall, the types of events that take place and information about the groups that use the hall. There is good access for the disabled, and we now have high speed broadband throughout the building. We intend to further improve and extend the hall in the near future. The hall consists of one room suitable for small meetings, a fully equipped kitchen and the main hall which seats around 80. Both rooms benefit from gas fired central heating. In addition to male and female toilets there are facilities for those with disabilities and all rooms are on one level. There are several electric power points in both rooms. Medbourne Village Hall boasts the original school playground and a grassed recreational area making it a popular choice for those looking to hire a venue in the Welland Valley. 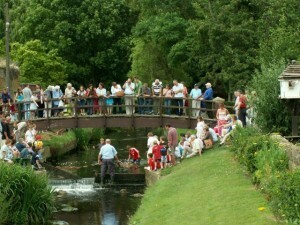 Event organisers during the year use the space for fetes, plant sales and of course parties! During the summer there is often a marquee hosting a wedding or special event. The hall now benefits from a ramp which was installed in the Spring of 2014, improving access for parents with buggies and wheelchair users. There is parking on the road outside the hall for around ten vehicles and the hard area can be used for parking for people with disabilities if the ground is firm.